To my surprise I often get asked about glass lenses. Interestingly many people still seem to consider glass as an option for spectacle lenses as they have the wrong idea about technology of spectacle lenses these days. In short my answer would be that glass is too heavy, too unsafe and just plain outdated technology. Glass is the hardest lens material and offers protection against scratches – HOWEVER glass lenses can shatter more easily than plastic lenses, are twice as heavy as plastic lenses, and don't provide as much protection from the sun's harmful ultraviolet (UV) rays. For many years, CR-39 plastic has been the standard lens material for eyeglasses. (The "CR-39" is the name given to the resin formulation by the original manufacturer.) CR-39 plastic lenses are half the weight of glass lenses, have better ultraviolet (UV) light protection, are less prone to shattering, and can be tinted more easily. And with added scratch-resistant coatings, they are nearly as resistant to scratches as glass lenses. Polycarbonate was one of the first "thinner, lighter" lens materials. 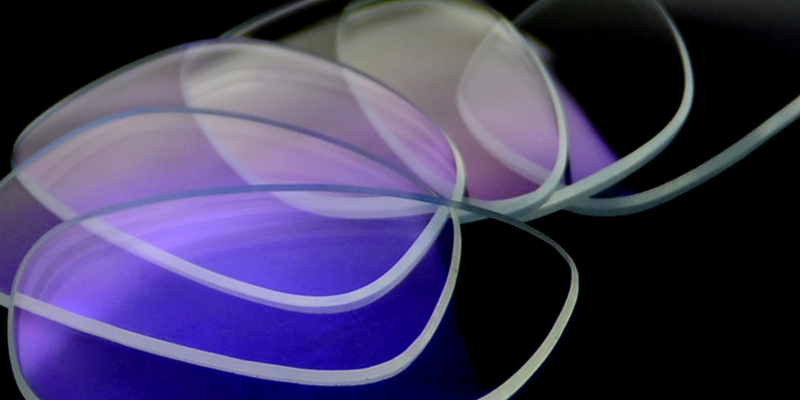 Polycarbonate lenses are both thinner and lighter than CR-39 plastic lenses. But the most important feature of polycarbonate lenses is their impact resistance. Polycarbonate lenses are 10 times more impact-resistant than glass or regular plastic lenses, making them the preferred choice for safety glasses and eyewear for children and adults who desire lightweight, protective lenses. I am not a huge fan of polycarbonate as it also is very soft and tends to get scratched easily. I would rather opt for a higher index, high tensile lens with a good Teflon coating. High index plastic is a term used to describe a variety of plastic lens materials that are thinner and lighter than regular CR-39 plastic. For a given prescription power and lens design, the factor that determines lens thickness is the index of refraction (also called refractive index) of the lens material. Materials with a higher refractive index bend light more efficiently than materials with a lower index of refraction. CR-39 plastic lenses have a refractive index of 1.498. Any lens material that has a refractive index higher than glass (1.523) is considered a high index material. High index lenses range in plastic up to a 1.74 and in glass up to 1.90. Lenses with an index of 1.67 are about 50% thinner than lenses made of standard CR-39 plastic. High tensile lenses in a 1.6 are also used for rimless frames as the material is more resistant to stress and pressure and unlikely to break. All in all it comes down to budget and aesthetics. The high index lenses are complex and labour intense to manufacture. Your best bet is to come in and chat to us about the various options available which will depend on frame choice and prescription.